Can’t arrange to have everyone meet? Want input from a larger cross-section of stakeholders? No money to support the travel? Sure, face-to-face meetings are best. 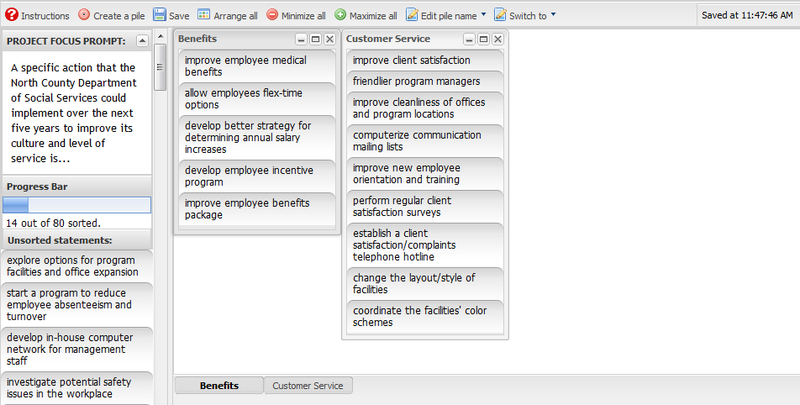 But there are times you’d rather meet different time-different place with the support of sophisticated decision tools. Working closely, Prism and the client agree to an explicit focus for the Internet project, such as the design of a product, service or the strategic performance objectives for the organization. We then proceed in five phases. First we invite all participants to log on to a web site and contribute statements related to the project focus. These responses are then reduced to between 80 and 100 discrete statements related to the project focus. Participants are invited back to the Web site to sort the statements. Sorting occurs as participants use a “drag and drop” method to place similar statements into like clusters and then name those clusters. Participants also return to the Web site to rate the statements in one or more ways: for example, relative importance, current performance, urgency, etc. Scales are typically 1 to 9 or 1 to 5. Individual user passwords give complete protection for each project while varying user status levels provide access control. Powerful mathematical algorithms analyze all sorting information and display the results in a concept map. 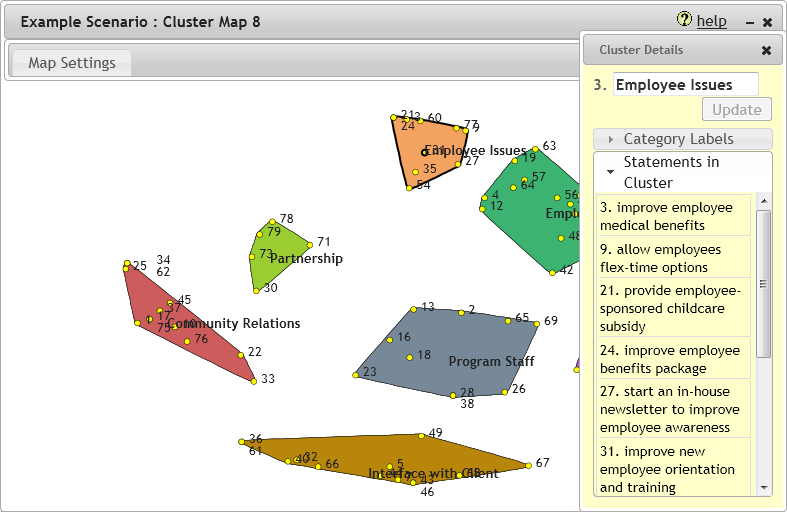 The analysis automatically takes the sorted ideas, clusters them into concepts or groups of ideas and places the clusters on the map. Ideas and clusters that are closer together are more similar than ones that are farther apart. In the example, the Employee Issues cluster is closer to (more similar to) Employee Relations/Communications than it is to the Databases cluster. 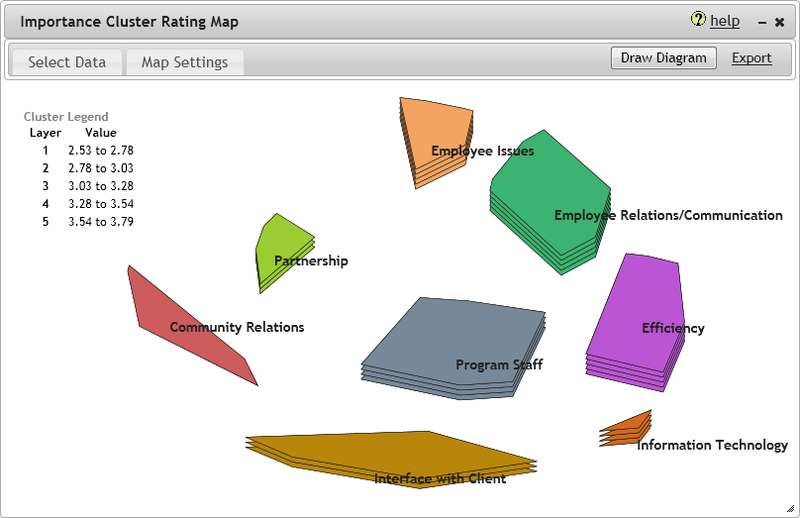 The layers in the clusters show the results of the ratings. The example below shows the relative importance of each cluster. Here, Efficiency and Employee Issues are considered by the raters to be the most important while Community Relations is judged least important. 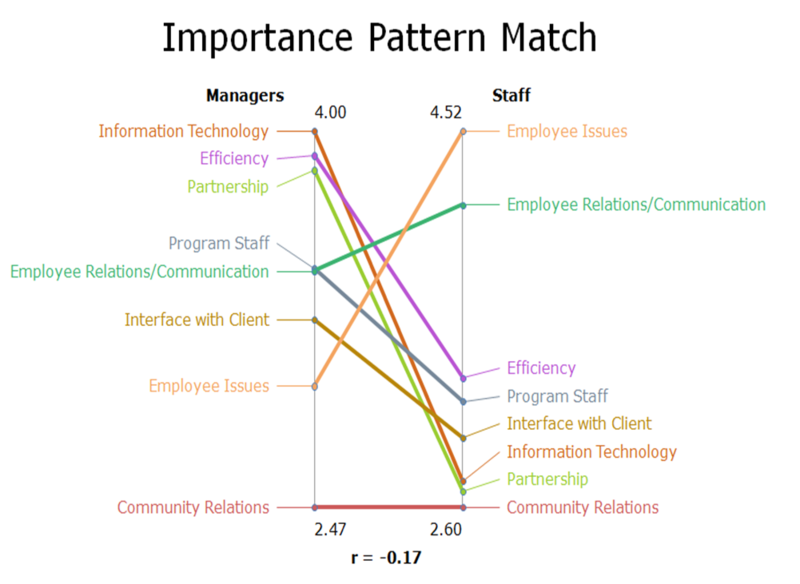 This pattern match shows the level of consensus between managers and staff working on a strategic planning project. Participants interpret the maps, discuss how the ideas are organized and identify the critical high priority areas. The concept map and ladder graphs reveal critical information. The group uses this critical information to set priorities, allocate resources, organize for action, and implement. All relevant data — users, demographic variables, sorts, ratings and measures — can be tracked throughout the life of the entire project. Over time, the group can evaluate progress on each cluster, compare that progress to cluster importance, determine gaps, and reallocate resources to ensure successful implementation. Groups participate different time/different place in the complete life cycle of a project: from white sheet thinking to implementation and evaluation. The Concept System™ is licensed to Prism by Concept Systems, Inc.